In mid-April, I made a little trip out to Chicago to meet up with some friends/colleagues of mine for the Wax Trax! Restrospectacle. For those out of the loop Wax Trax! Records is a long-gone, legendary industrial rock record label which originated in Chicago. A bunch of the original artists on the label came together for a limited 3-day show at the Metro, I was lucky enough to attend (Thanks Brent and Patrick). Sure, the weekend involved great music, camaraderie and deep-dish pizza, but as we all know, that’s not why you’re reading this blog entry. Well, as luck would have it, (and thanks to some of my Twitter followers), I was tipped off to some pretty cool toy places to visit while in Chicago. 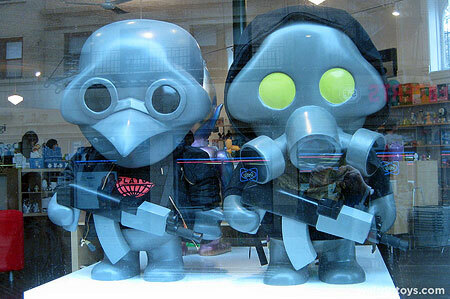 The two stores which piqued my interest most were Quake Collectibles and Rotofugi. As you’ll soon see, they may both be in the toy world, but they truly seem worlds apart. First stop was Quake Collectibles. My buddies and I actually arrived just before store opening. That was the perfect way for me to announce “I’m a toy dork who cannot wait for this store to open.” Hey, I’m not ashamed. As we waited outside, I was already getting antsy. I tried peaking through the front windows, but they were so crammed full of random crap, I couldn’t see in. 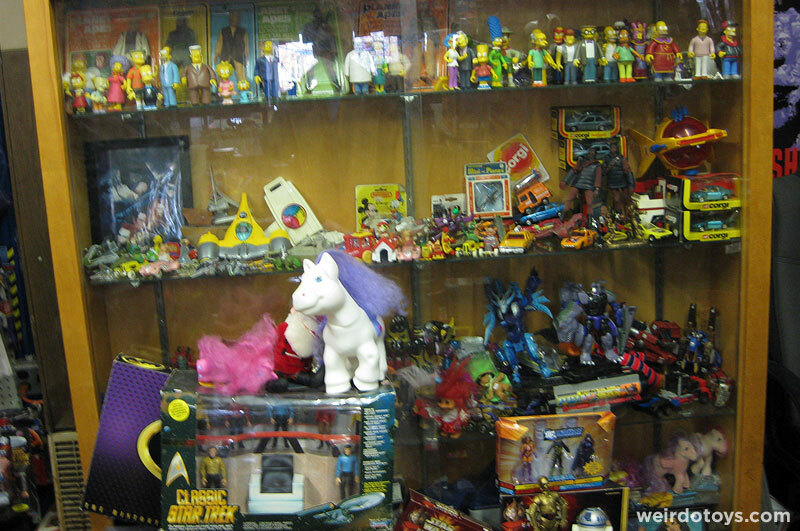 Window toy clutter – this was gonna be my kind of place. After several minutes (which seemed a lot longer on a cold, rainy Chicago day) we finally stepped in, and let me just say. I was floored. Sooo much crap everywhere. Every inch of that place is covered by a poster, a sticker, a toy or a lunchbox. If your mom threw it away when you were a kid, it probably ended up here. I love places like this. There’s just so much stuff, you have to just stand in awe and inspect every millimeter. Some may find it overwhelming or annoying, because you may miss something, but I find it charming. 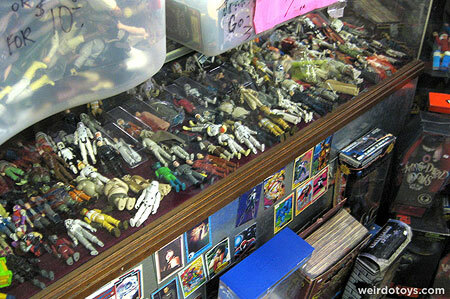 It kind of reminds me of an episode of Hoarders… featuring the homes of some toy collectors. Oh yeah. 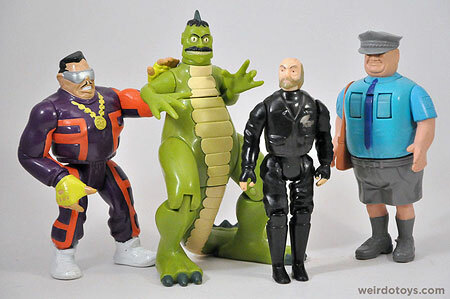 So among all the clutter, I didn’t actually find much that I was looking for, but I did manage to pick up some “bargain bin” figures – a wrestler manager figure James bond Jr.’s “Oddjob.” that “Dinosaur Neil” guy from The Tick, “Bob the Goon” from the Batman movie toyline and the haunted Mailman from The Real Ghostbusters. I actually left Quake saddened and confused. The store was so great and I was thrilled to be in there, yet I found so little. I think it’s all due to my tastes in toys. They’ve become too discriminatory or something. Well, that feeling left quickly as we continued on to Rotofugi, (on foot) through a pretty chilly, windy day. I don’t know if we were being dumb for not calling a cab, or just cheap… but at least we got some exercise. Next stop on the toy express was Rotofugi. As soon as I laid eyes on it, I knew this place was pretty much the complete opposite of Quake (well, aeshetically anyway). For example, their walls were glass with a handful of HUGE figures on display. Statues basically. And once you walk in, it’s pretty clear that this is so much more spacious, clean, crisp and bright retail environment. 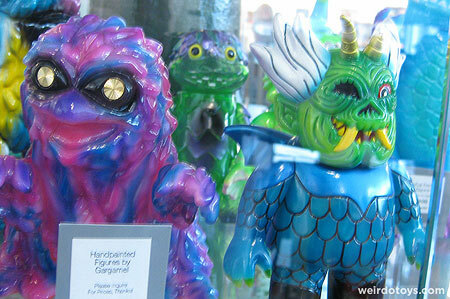 Not only that, but it has a small art gallery attached displaying various paintings and custom toys. 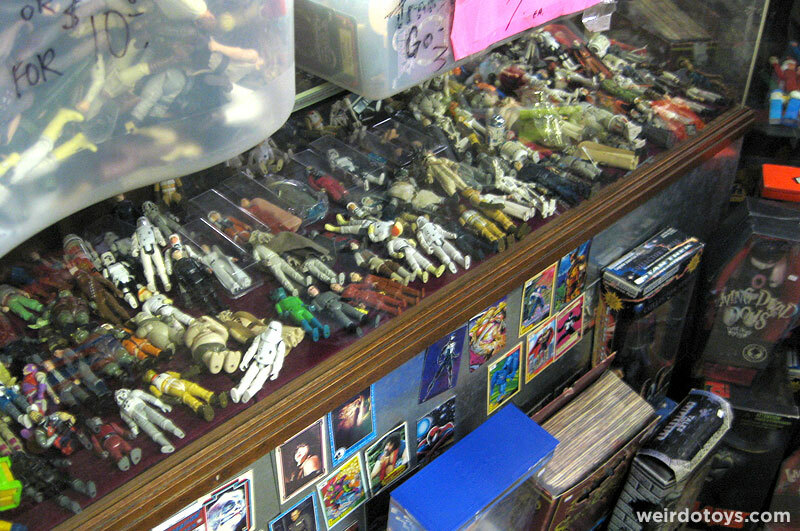 The market for these toys weren’t random comic geeks looking to find a vintage Jawa w/ plastic robe… This is the place where some artist will rip off a Jawa, paint it neon pink and ask $75 for it. Ha! 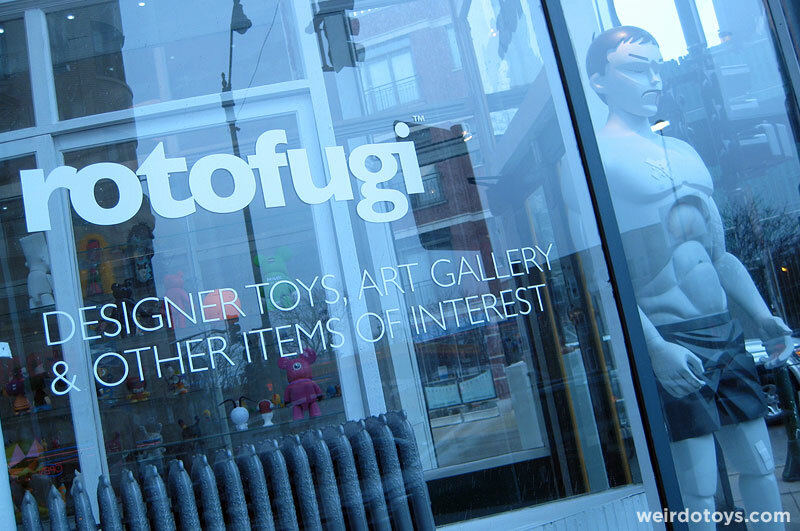 Seriously though, this seems to be Chicago’s home for designer toys. They present toys as art. Which is cool… just don’t expect to find any bargain bins. The store is spacious and organized and feels very much like a gallery. This presentation really does sell “toy as art” really well. but there are tons of little toys to check out from some of your favorite designer toy companies and artists. I didn’t get much here either, because all the figures I liked were $60+. I really loved so much of the creatures/characters on the shelves. 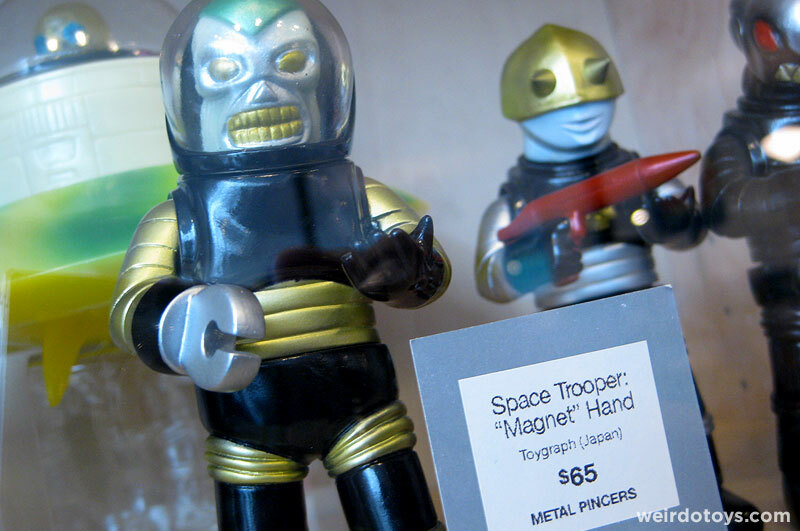 (If only Weirdo Toys had a financial backer.) They are just so quirky and fun. I, of course, passed on the higher-end stuff and decided to pick up a few blind-boxed figures. I got a Dunny from the Azteca 2 series and some Blow-Up Dolls Series 3 figures. I even managed to get a Crappy Cat BUD. Pretty cool huh? Tags: chicago, designer, Toy Stores, Vintage, wax trax! you took great photos. Thanks for sharing with us. No prob. Glad the photos came to good use. Wow, thanks for the report! I will keep these in mind for my next visit. I like the contrast between the two shops, though I’m drawn to the clutter with its thrill of the hunt/buried treasure potential. In the pre-internet dark ages I think I remember reading about Quake in a zine called Freakie Magnet. 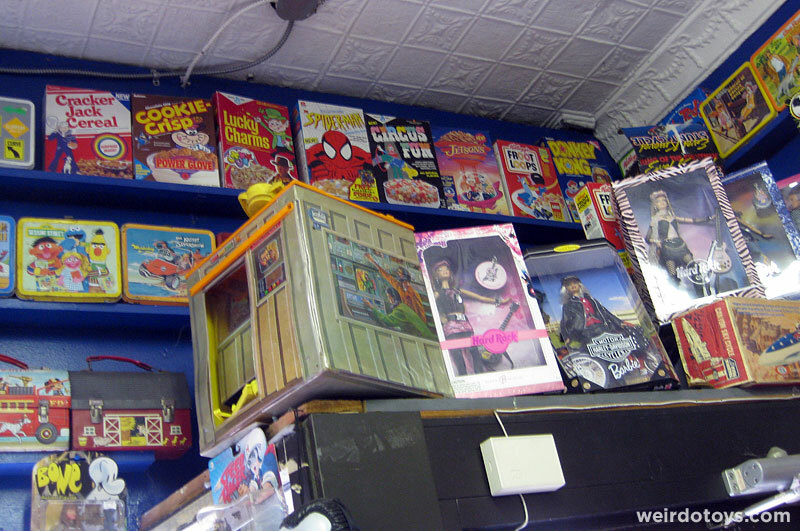 I think they used to have a cereal box/prize collectors meeting there and I wished I could go. Although now, with ebay a lot of that stuff is WAY cheaper so it’s probably for the best that I couldn’t. Glad to see it’s still there though. Love that they have Fisher Price stuff. Wow. You saw Quake in a ‘zine. That’s great. Now I feel like I’ve visited a historical landmark. Also, I’m with you. The thrill of the hunt in the “buried treasure” style store is a bit more fun. Awesome man. Thanks for the links. That’s actually Rotofugi’s old location. 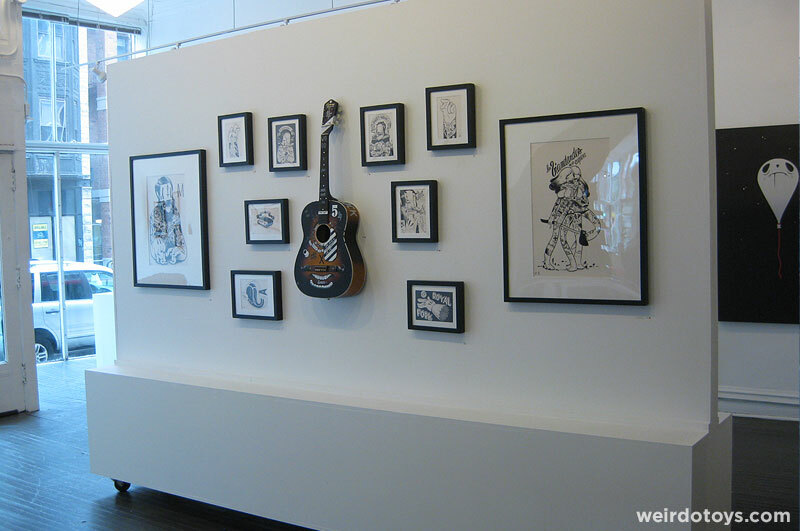 They’re in a much larger gallery space now. 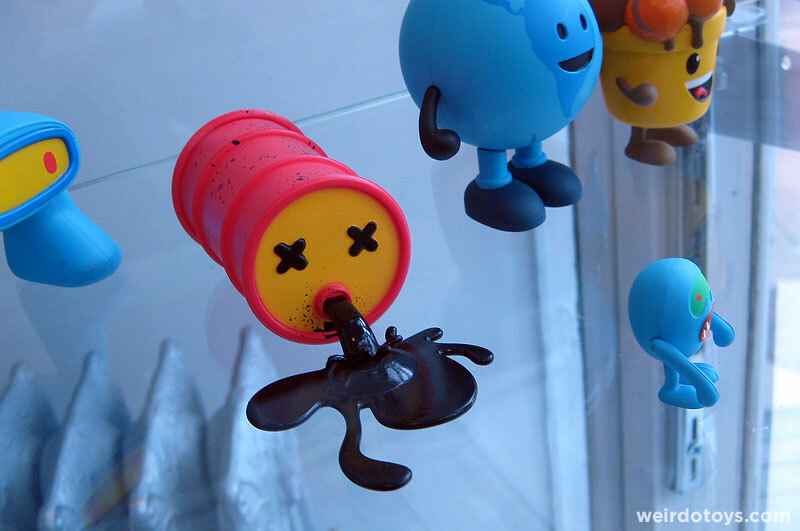 OMG…I just love the shop with designer toys!!! It is pretty nice. I wish I had something like that closer to home. How’s this for fate? My sister and I are headed to Chicago in August to visit some friends, so this trip of yours certainly helps me plan ahead! There is no way I’m leaving Chicago without checking both of those stores. No way. I’m glad you are the nerd who knew about 90s Oddjob. 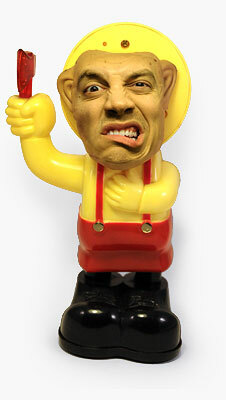 I guessed he was a wrestling figure, because I found him in a tub with other wrestlers. Now I’m obligated to check out the rest of that James Bond Jr. toyline. Also, have fun with your sis in Chicago. Glad I could provide a bit of insight. 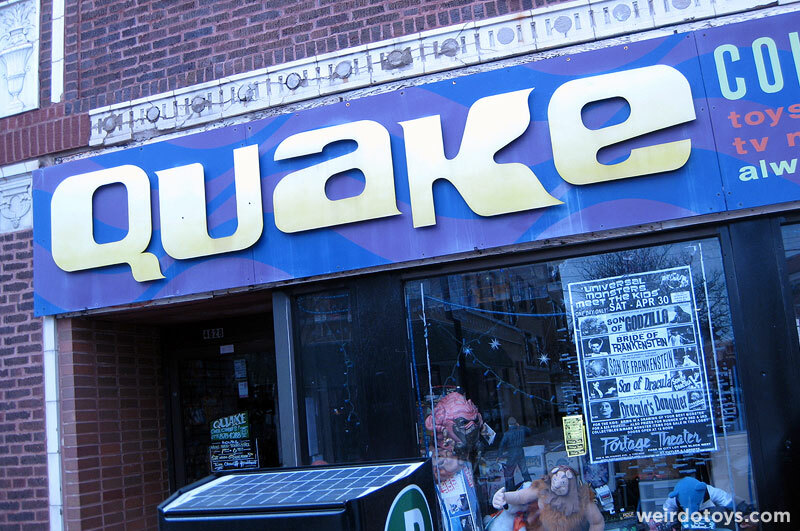 That Quake shop looks fantastic! I love how they sell old and new side by side. You might not have found much there, but I think I might have dropped a buck or two! Yeah, I’m thinking you’d leave the place w/ a U-Haul full of stuff. Never commented here before, but I’ve been reading for a long time! 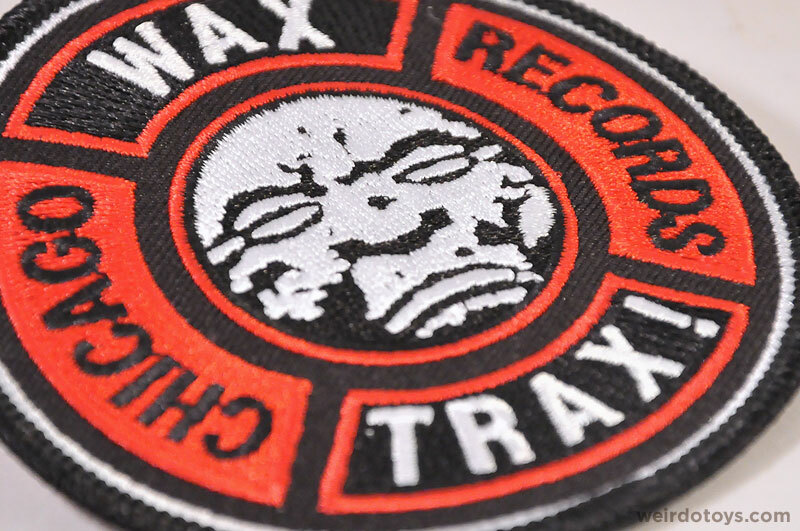 When I saw the Wax Trax patch up top, I just had to write two things. I can’t believe you work for KMFDM; they are one of my favorite bands, as well as Ministry, Thrill Kill Kult, and Lords of Acid. I would have loved to be at that Wax Trax show! Also, in Chicago, there is another store like the first one. It’s called “Uncle Fun” and it’s on West Belmont. 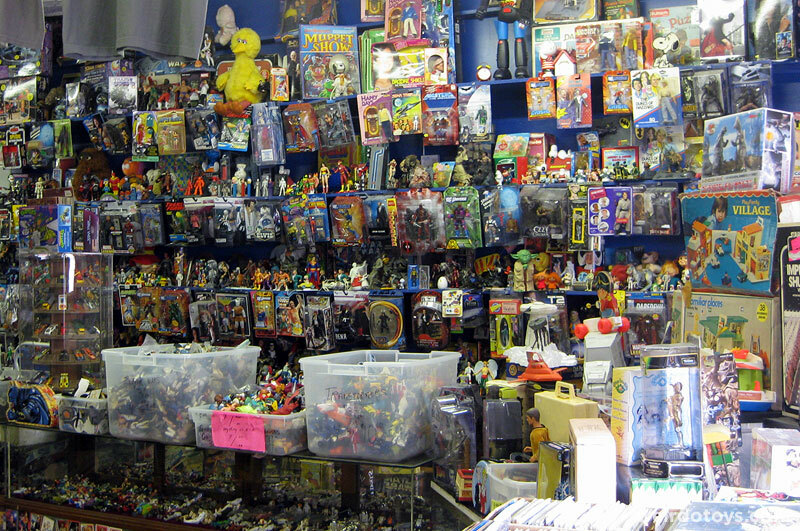 All kinds of stickers, cartoon plates, action figures, weird random crap. I spent like $60 the last time I was there, but I got two big bags full of junk! It was awesome! Anyway, the art layout on the new album looks great; par for the course. I’ve always thought KMFDM had some of the most striking album covers, but to find out who does the layout is really cool too! 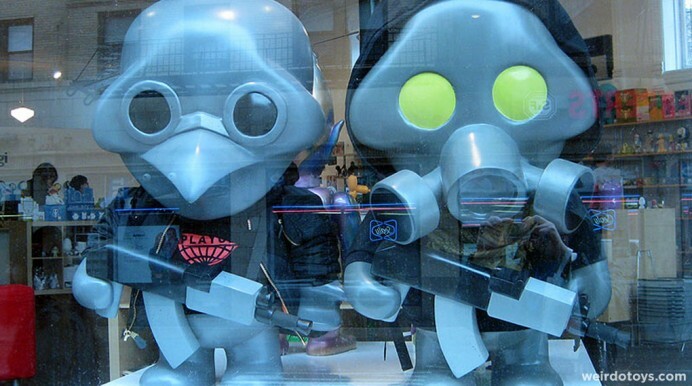 Quake looks amazing, whereas Rotofugi looks like the kind of place I’d have to have an acid shower after visiting. Hate all that designer toy stuff with a passion, yes sir. In the unlikely event of my crossing of the Atlantic sometime in the next couple of years, Quake will be a definite destination. Nearest I’ve got to that is a place called Who Collectables, up in Blackpool. I’ll take some pictures next time I’m up there (thinking it won’t be until November, but maybe sooner, who knows?). Wow! Thanks for the sharing here. I would have spend hours in these locations! *jaw drop* Oh god I would love to go to that store and look around! Only time I’m ever near there is when i travel up to Canada. Maybe one day i should stop by that store if it still there. 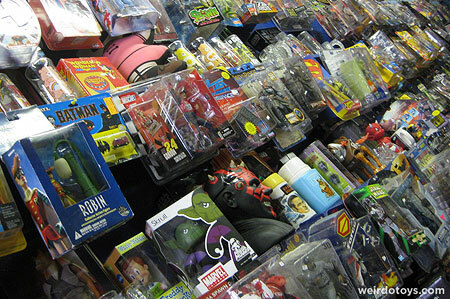 The toy shops look familiar- In L.A.? 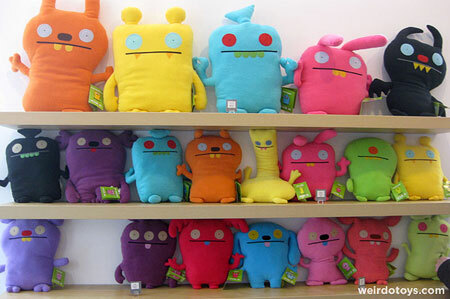 THere is a great Japanese store, (Rotofugi?) all glass, in Chinatown, next door to the Empress Pavilion restaurant. Where can I get that round wax trax patch? That rocks!!!! !